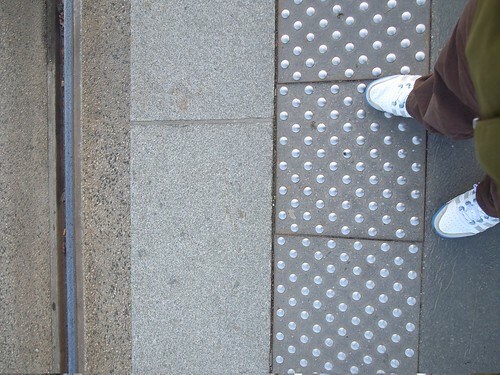 This is what the french calls a "podotactile", namely a textured strip which runs along the edge of the metro/tram station platform or even sidewalk, which one can feel with the feet. It's meant to warn people (blind or not) that there is limit/boundary between a space one is free to walk in and another area that can be dangerous. So the texture affords the limit (Bruno Latour would say that this "non-human" artifact is a way to delegate a function to an object). This leads to another kind of "touch" feeling: in a sense "podotactility" is about feeling with the feet. So why this is interesting? I quite like this example because it shows how textures are important and can have affordances (especially in physical space). Would it be possible to use podotactility in innovative way, beyond signaling people that there are dangers? Yes, of course, but what will happen if it has several affordances? A possible solution would be to use different granularities. Will then people learn these new codes (lot of space between dots = low danger, close dots = big danger)? Certainly food for thoughts for near-field interactions. And of course, in terms of digital equivalent, there are some projects that propose some rugosity in mouse interactions/force feedback that can be perceived by similar (felt by the hand though).